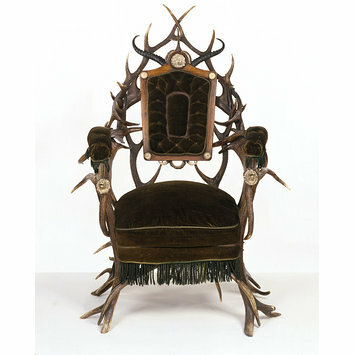 Only the back and seat of this chair are of wood, upholstered in green wool plush. The rest of the frame is entirely made up of stags' antlers (from two different species of deer), goat horns and boar tusks. Such furniture may seem rather gruesome to modern taste. It was extremely fashionable, however, in the years around 1850, although it must always have been very expensive and thus confined to a small market. People of the time were quite unworried about the conservation of natural species. They readily used feathers and stuffed birds for their hats and stuffed birds and animals for interior decoration, with animal-skin rugs on the floors. 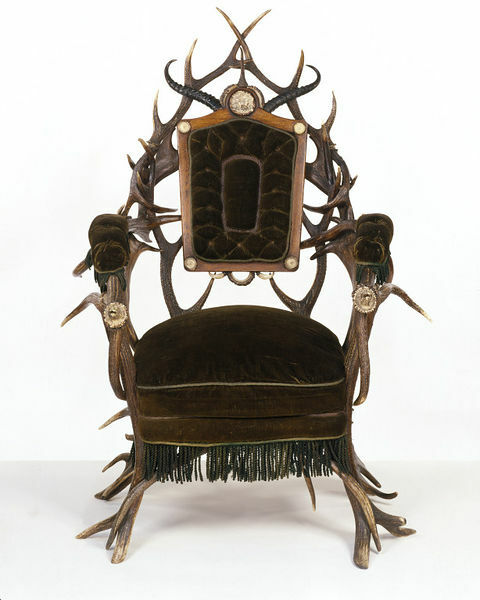 Furniture such as this was considered suitable for hunting lodges, where the day might be passed in stalking and shooting the same kind of deer. Such furniture was available throughout Northern Europe and in North America, but it seems to have been particularly popular in the German states. The best-known manufacturer was H. F. C. Rampendahl of Hamburg, who exhibited at several of the international exhibitions. Only the back and seat of this chair are wooden. The rest of the frame is entirely made up of antlers, goat horns and boar tusks. Such furniture was considered suitable for hunting lodges, and was particularly popular in the German states around 1850-70. The best known manufacturer was H.F.C. Rampendahl, who exhibited at several of the international exhibitions.